In 1892, a new U.S. coinage theme developed by Mint Engraver Charles Barber appeared on the dime, quarter, and half dollar. Barber coinage, as we call it today, served the nation until 1916. Aside from the legendary 1894-S, the key date challenge of the Barber Dimes is the 1895-O. With a mintage of only 440,000, it survives in very low numbers, and is always of keen interest to coin collectors. Let's measure the scarcity of the 1895-O another way. One of the biggest and best coin auction companies, Heritage Auctions of Dallas, TX, has sold 12,845 Barber Dimes over the years (as of this writing). They specialize in "higher end" stuff. Of this number, only 286 of them have been examples of the 1895-O, ranging in condition from Fair-2 to MS-66. That computes to only 2.2% of all Barber Dimes Heritage Auctions has sold. The 1895-O Barber Dime is the key date of the series, so naturally it attracts much attention, yet this small number is all the examples they could post on their site. When comparing the long term performance of the 1895-O dime to the overall trend of the Rare Coin Values Index, it's obvious this date does not come in first place in terms of price tag or rate of percentage gains. Nevertheless, collectors should feel confident when buying, if the plan is to hold for a minimum of a few years. The 1895-O Barber Dime is the key date of the series, discounting the ultra rare 1894-S, of course. It is a worthy acquisition in any grade. 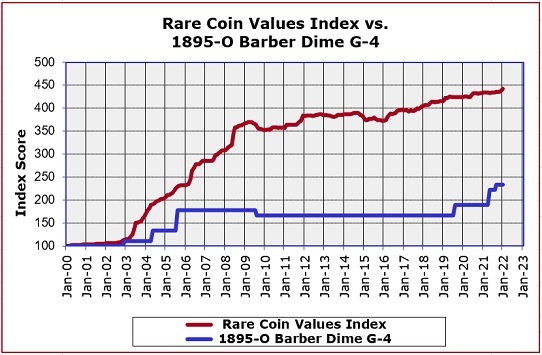 However, the 1895-O Barber Dime still rates well below the Rare Coin Values Index score, which is the composite percent change since Year 2000 of a pre-selected group of 87 rare US coins, the purpose of which is to chart the strength and direction of the overall rare US coin market. The 1895-O dime is one of the 87 coins in the Index. The blue line above represents the percent change in retail value of the 1895-O dime in G-4 condition. The red line charts the percent value increase of the Rare Coin Values Index. Both start in Year 2000 with a baseline score of 100. The Index is updated monthly.